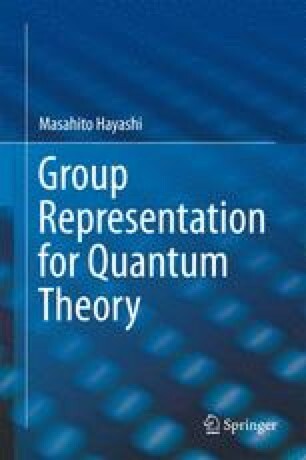 This chapter discusses representations for group in a general framework including projective representations, which are important in quantum theory. Since a projective representation is closely related to extension of group, this chapter focuses on this relation. To discuss representation theory including projective representations, we need to handle the factor system, i.e., the set of phase factors, which requires complicated notations. The discussions with projective representations are complicated and are often omitted in introductory book for mathematics. However, they are more essential for quantum theory. So, this chapter handles projective representations by using factor systems and we keep this style during the whole book. In the latter part of this chapter, we proceed to the details of representations of finite groups so that it introduces the Fourier transform for finite groups, which connects analysis and algebra. As a typical example, we analyze representations of a permutation group by using Young diagrams.